[Everyday] Psychophilosophy » What’s Your Level of Creativity? What’s Your Level of Creativity? Who here would like to take a psychological test measuring creativity? Or a better question: who’s even here? Well, let’s assume the answer to both of those questions is “you,” so we can get straight into this classic psychology problem. Imagine that you have one candle, a book of matches, and a box of tacks. Your job is to fix a lit candle to the wall in such a way that the candle wax won’t drip onto the ground below. How do you achieve this? Now, don’t be frustrated if a solution doesn’t come right away; only about 25% of people actually solve it. Creativity itself is a very difficult topic to measure in psychology. Because it is such an abstract and multifaceted concept, researchers themselves have to come up with creative ways to quantify it. For example, here’s the first way they measured creativity back in 1967: Imagine you have a brick. List as many possible uses for this object as you can. Functional fixedness is the notion that when we see an object, we only see its applicability or use in the typical form we encounter it in. So with the brick, we imagine its uses in line with what it was designed for. However, if you stretch your imagination, a brick could be used as a paperweight, a doorstop, a bug whacker. It could be a small step, a picnic blanket securer, a straight edge for drawing. Scores for a test like this are based on things like originality (i.e. how different are your responses from other peoples’?) and flexibility (i.e. how different are the categories for which you’re using the object?). Creativity, they’ve found, is usually the result of a divergent way of thinking, that is, a departure from the natural, functional fixedness we have when viewing objects or problems. So if you’re still working on that first question, does telling you not to consider the box of tacks as a box of tacks but instead as a box and tacks help you come up with the solution? If it doesn’t, next week I’ll be discussing simple ways to boost your creativity. 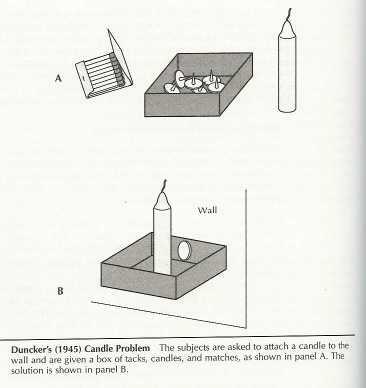 PS Here’s a link to the solution in case you can’t wait a week: candle problem answer. How do “manners” and “table” go together? I believe the connection comes from the phrase “table manners” — but maybe my recognition of this comes from how much my mother grilled them into me as a child. Life is good here on the West Coast. Those word associations are extremely challenging, I didn’t get any of them. Oh well. 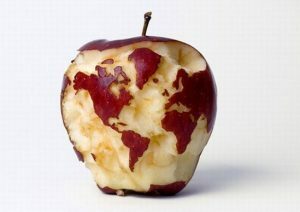 I like the picture of the apple/globe, an interesting and creative find. I imagine you sitting in your classes and labs, with fellow students and some professors, dropping knowledge bombs on each other on the regular, every daythere are paradigm shifts, cosmic realignments, and every perception you’ve ever had must be re-examined and re-evaluated based on this new K-Bomb. At least, that’s what your PhD program appears to be like. Haha Your perception of graduate school portrays it far more glamorously than it really is. While “knowledge bombs” are often dropped, I’m usually the one standing beneath them wondering, “Wait…is that a–” ker-BLAM! As for those word associations, I didn’t get any of them either. However, if you’re still interested in the answers, here they are: Long, Table, Head.